The Advanced Ecommerce Academy is a proven 9 week online program that will take you from being an absolute beginner to an advanced ecommerce expert. The program teaches you how to build a wildly profitable 6-figure ecommerce business fast. 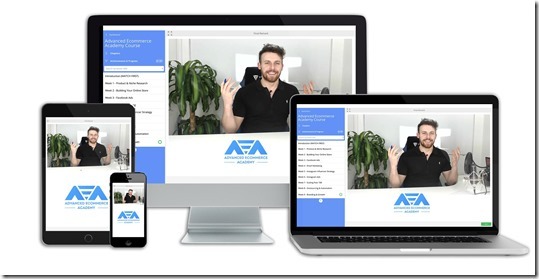 The Advanced Ecommerce Academy™ is available via our e-learning platform and is accessible from any device from anywhere in the world via your Internet connection. When joining the Advanced Ecommerce Academy you get access to our whole online platform. We provide the 9 week training in video, so that you can learn in a more engaging format. Each tutorial is easy to follow and jam packed with the most insightful information you will need for this journey. Access the training online from any desk or mobile device anywhere in the world anytime you like. The fundamentals of ecommerce and all the terminology you will need to give you a competitive edge. Understanding and finding a niche that would suit your store. The secret product research methods we have used to find hot products to generate over 7-figures. The exact steps to build a high converting store from absolute scratch. The correct approach to setup re-marketing for your store. The tutorials for setting up your business emails, Google analytics, logo, domain and other requirements. The fundamentals and terminology of Facebook ads from absolute beginner to becoming an expert. How to setup your Facebook pixel, leverage audience insights and launch your first ads. How to setup effective testing, build effective video ads, build audiences and analyse your ads. How to get started with email marketing with no prior writing experience. The essential automated email campaigns to be setup for running a successful ecommerce store. How to build a lucrative and meaningful long lasting relationship with your customers via emails and how to automate that process. How to leverage Instagram influencers for a massive ROI and located them fast and effectively. How to build your stores Instagram presence and how to grow your account into a brand. How to find Instagram influencers, vet them to check the quality and how to negotiate and close a deal with them. The difference of Instagram ads and Facebook ads. How to build and launch effective Instagram ads. How to build highly lucrative Instagram story ads. Advanced conversion optimization and basics to scaling your online store pat the $10k per month mark. How to scale your Facebook ads through our secret strategies and enter into new markets. How to increase average order value, increase cross selling and leveraging user generated content. How to effectively outsource and automate your customer support so that you can focus on growth. How to outsource your fulfilment processes. How to automate your entire ecommerce business to turn it into passive income and you can focus on building more stores. How to brand and take ownership of your hot selling products. Setting up the fulfilment infrastructure for your own products and use print on demand for other branded items. How to transition your store to a brand and how to sell that brand for up to 4x your profit! Thank you for sharing. Please send me a link. Thank you.